SSR LLC – Trying to Make Sense of GE: Are the Green Shoots Appearing? GE is one of the most complex conglomerates. 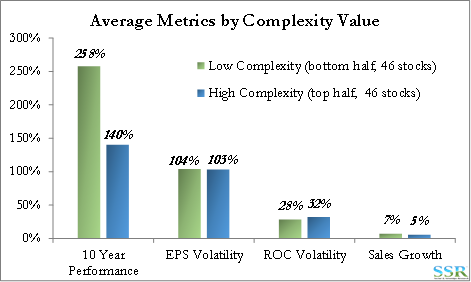 Increasing complexity has over time been a detractor to shareholder returns – see our published research on this topic. Although significant portfolio pruning and adjusting has been done there is clearly much more to do – the benefits of these diverse businesses under one roof are not clear. GE management has been consistently over-optimistic. 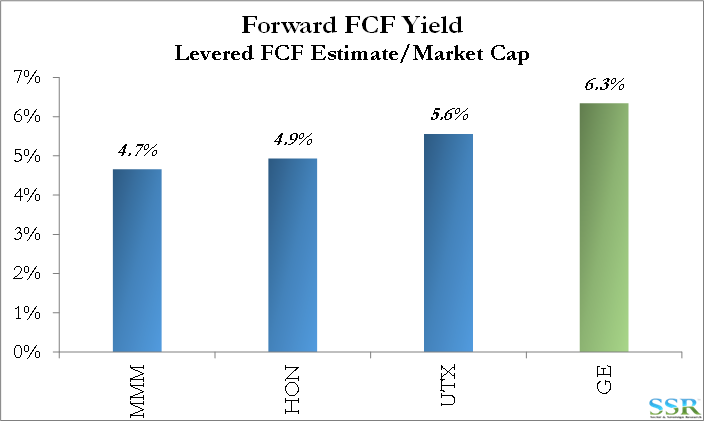 Earnings guidance at the start of the year has been routinely missed and compares unfavorably to other Conglomerates. Excess optimism leads to poor capital allocation decisions and sub optimal returns – see our published research on this topic. Note that the only examples we have seen of companies switching from optimism to a more conservative approach and vice versa have required some sort of regime change. Unwinding some of the web of financial assets is a positive, as is the creation of a publicly traded Oil and Gas business, but the pace of change to a focused, faster growing company is too slow. Activist interest (by Nelson Peltz’s Trian Partners) is encouraging but their pathway to $2.20/share in 2018 as detailed in their October 2015 White Paper appears a stretch without more aggressive actions – current consensus is for $1.90/share in 2018. The potential at GE may be significant and current valuation appears to give management no credit for improvements made so far, and still possible with a revised and more radical plan. If GE’s Industrial businesses could achieve the same returns (15% ROA) as other Conglomerates then this alone could deliver $2.00/share of earnings making a total of $2.60-$2.75/share by the end of the decade very possible. 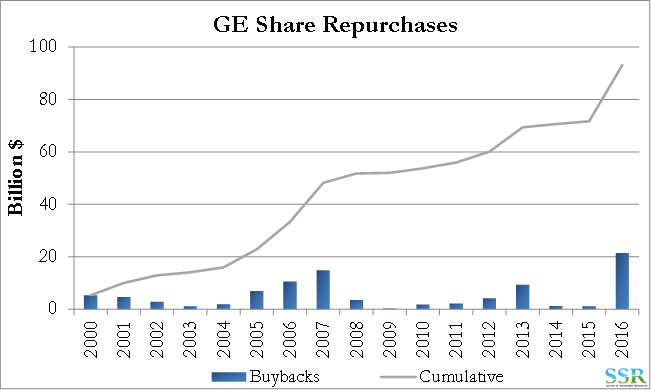 GE has strong cash generation, though the balance sheet still looks stretched and complicated by the residual financial assets. Cash provides ample opportunities for selective M&A as well as continued share buyback and dividend increases – some business divestments could help. Activist unrest with the current progress can only help, and Trian Partners’ history of success in effecting change is strong. Short term catalysts are always difficult to predict but CEO transition cannot be ruled out. With all these changes, $2.60+ earnings by the end of the decade appears achievable, supporting a stock price in excess of $45, along with a healthy and growing dividend (3.2% yield currently). GE’s massive value destruction since 2000 is summarized in Exhibit 2, and compares with the other large conglomerates in Exhibits 3, 4 and 5. 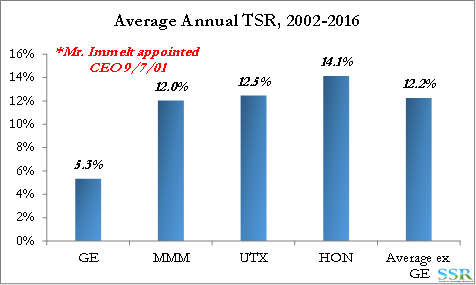 Exhibit 6 shows a summary of GE’s TSR versus its peer group since 2002. Note from Exhibit 2 that the decline started well before the change in CEO. To be fair, Mr. Immelt was handed a company with lots of problems – and far too much leverage to the financial markets – but he had years to address that ahead of the financial meltdown and his critics point to a lack of action and speed as well as an incremental approach to transforming and improving the portfolio rather than something radical. Whether something more radical would have helped or resulted in a better position than today is of course almost impossible to judge. 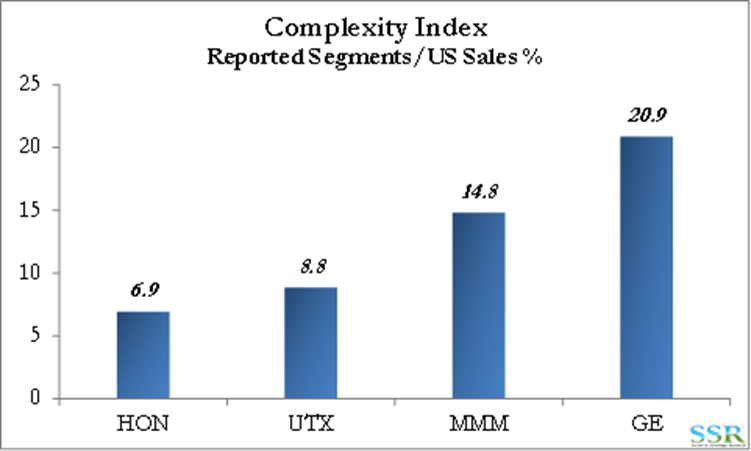 We have written extensively on the market’s declining appetite for complex stories – the chart below was first used in our prior work on corporate complexity and shows significant underperformance for the most complex companies relative to less complex peers, despite similar levels of growth and volatility. GE is among the most complex companies in our universe based on our simple measure (reporting segments divided by US sales percentage, meaning complexity increases with the number of reporting segments and non-US sales), made worse by the very diverse nature of the businesses – the machinery/capital equipment/energy segments make sense together because of common technologies, but financials, other than equipment based leases, and healthcare make no sense to us at all as the analytical complexity they bring to the story more than outweighs any earnings cyclicality benefits. It is also likely that there are more unnecessary costs buried within GE than the company recognizes and we note that when Ed Breen first took on DuPont (before the Dow deal) he was focused on what he thought was a huge cost opportunity at DuPont but was public with his recognition that he might have to break the company up to get to all of the redundant costs – a strategy that worked at Tyco. Our analysis of corporate optimism is done under the assumption that management has a key role in setting expectations for the investment community, and that EPS estimates reflect explicit or implicit corporate guidance. 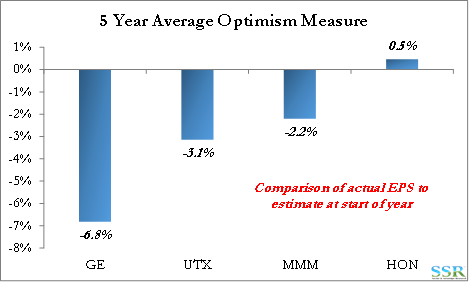 The “optimism” measure we use compares a company’s beginning year EPS estimate to the actual result achieved. On this basis GE has been consistently more optimistic than peers – Exhibit 9. 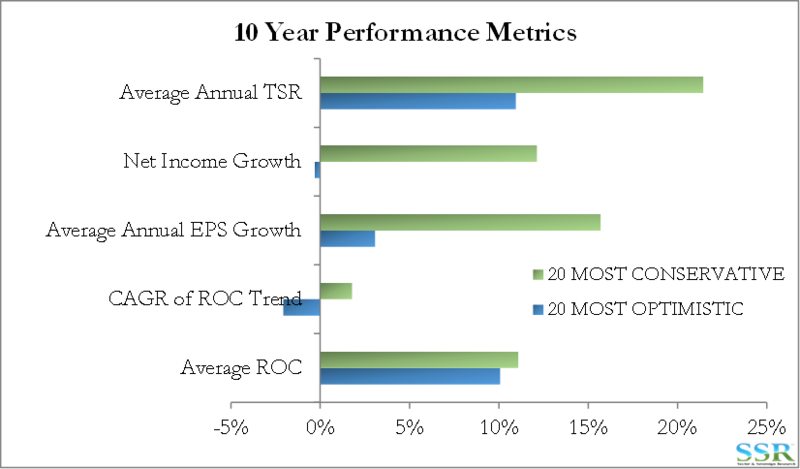 The consequences of corporate optimism are summarized below in Exhibit 10 – namely, underperformance and misallocation of capital resulting in declining ROC trends, suggesting that the notion of corporate optimism runs deeper than guidance/estimates and pervades a company’s broader capital allocation process. 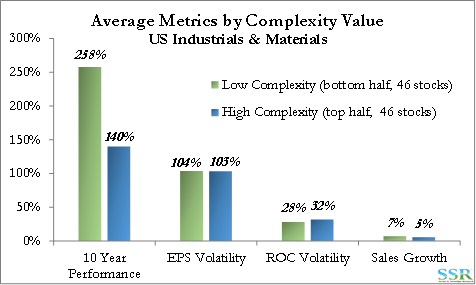 Data here reflects the 20 stocks on either extreme of our universe of 100+ Industrials & Materials companies. Trian’s activist track record – as summarized by Capital IQ – is shown in Exhibit 11. It is interesting that DuPont is the campaign that shows as “unsuccessful”. While Trian failed in the proxy fight, the event led to the CEO change and the deal with DOW and outperformance (albeit not that much) since the changes. It has already been suggested in the press that Trian has questioned whether Mr. Immelt should remain in his role – a role he has had for more than 15 years. This is rare for a large company and given the performance of the company over that period does not speak well of corporate governance at GE – also likely a target for Trian. The movement of the stock since Trian’s involvement, however, suggests that investors cannot think of an easy fix – with or without a change of leadership. 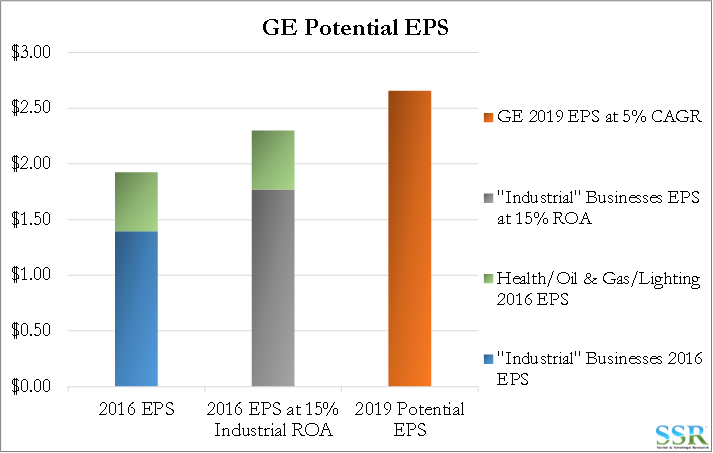 GE has many levers available to pull to improve returns – cost cutting and portfolio rationalization being fertile areas. 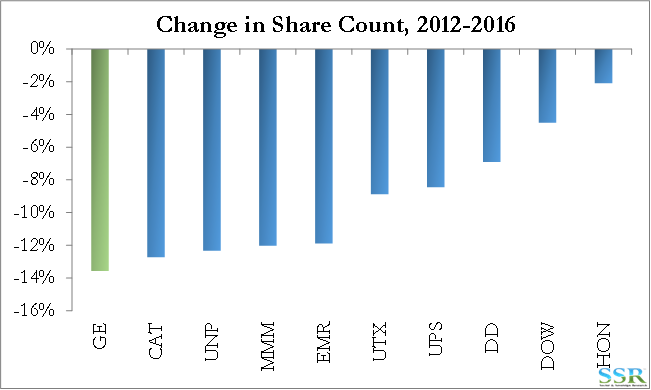 The Industrials business which comprises of 60% of GE’s asset base (excluding Capital) and 70% of it 2016 earnings (excluding Capital) has returns which lag its industrial conglomerate peers. If these businesses generated a 15% return on assets (in line with peers) the improvement in that alone would be $0.40/share pushing total EPS to around $2.65 by 2019 even without heroic assumptions of other corporate moves that could be possible. 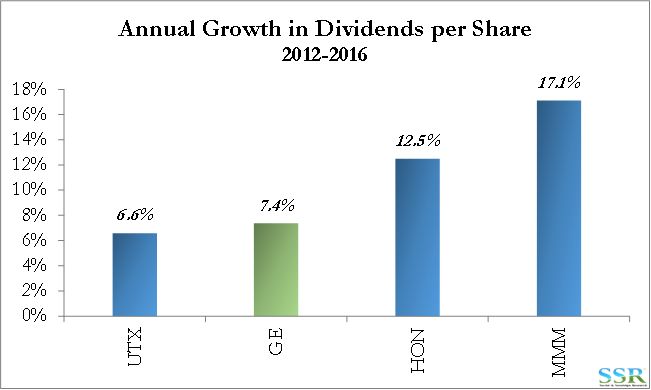 GE has plenty of free cash flow and is using cash to grow its dividend and buy back shares (Exhibits 13-16). If you believed in the earnings story above – or in the ability of Trian to effect change, you are being paid to wait.